Universal Industrial Gases, Inc: Composition of Air - Components & Properties of Air - Answers to "What is air?" - "What is air made up of?" -" What are air products and what are they used for?" Most of the time we take air for granted. We breathe it with hardly any conscious thought. We use it to burn fuels for heating, transportation, power generation and many other purposes. Sometimes, we do think about air. We recognize that it is essential for life as we know it. We sometimes worry about what we and others may be doing to local air quality and to the composition of our shared global atmosphere. What is air? What is air made up of? What are some of its characteristics? What useful products are directly produced from air? This page provides answers to these and other questions. "Air" is the name we give to the mixture of gases which make up the Earth's atmosphere. The composition, physical, and chemical properties of air are very similar everywhere. Standard dry air, which is mainly composed of three gases: nitrogen (about 78%), oxygen (about 21%), and argon (about 1%). Together, these three gases make up 99.96% of dry air. All three can be economically recovered as industrial gas products. Standard dry air also contains a small amount of carbon dioxide, and very small amounts of neon, helium, krypton, hydrogen and xenon (see table below). Water vapor (humidity). The amount of water vapor in air at ground level can vary quite a bit - from almost zero to about 5 percent. Many factors influence the amount of humidity in the air at a given location and time. The Composition of Standard Dry Air is shown in Table 1. The Physical Properties of Standard Dry Air are shown in Table 2. They reflect the mix of standard air components shown below. Some common but "non-standard" components include methane and sulfur dioxide (which can be present in the parts per million range) nitrous oxide, nitrogen dioxide, ammonia and carbon monoxide. Carbon dioxide (CO2) is considered to be a "standard" component of air, although the average concentration of carbon dioxide in air is currently increasing at the rate of about 2.5 ppmv per year, and the concentration varies somewhat by location and season of the year. Any "standard" value for the concentration of carbon dioxide in air is an approximation. It is more meaningful to assign a range to the concentration of atmospheric carbon dioxide than to use a single value. At this time, 404 ppmv +/- 3 ppmv is a reasonable value. View recent historical concentration data. Future CO2 ranges will presumably continue to rise at a rate of about 2.5 ppmv per year in the near term. Consequently, when designing systems which have long useful lifetimes, the ability to handle CO2 concentrations which may be present in a decade or two (circa 430 ppmv, for example) should be considered. Detailed data on the physical properties of the individual gases in air, including the air-derived industrial gas products (nitrogen, oxygen, argon, neon, krypton and xenon) and other commonly-encountered atmospheric components and contaminants can be found in tables on this website. The physical property data is presented in your choice of English or Metric units. As air temperature increases, so does its ability to hold water vapor. The upper limit on water vapor content is predictable for at a given temperature, but the actual amount of water vapor which is present in air at a given time and place will be determined by many factors. In temperate areas, the water vapor content will typically be between 1 to 2% in spring and fall, less than one-half percent in winter, and as much as 5% on a hot, humid summer day. In humid tropical areas, the water vapor content can be even higher, while in deserts, the water vapor content of air with the same (dry bulb) temperature may be very low. In near-polar regions the water vapor content of air will be less than 0.1%. Water vapor is less dense than air. (The molecular weight of water is 18.02 vs.28.98 for dry air.) Consequently, when water vapor is mixed with air, the density of the mixture will be less than that of dry air. The difference in density between dry air and saturated air increases with temperature, because the percentage of water in saturated air increases. This difference in density leads to a long-recognized link between fluctuations in barometric pressure and weather conditions. "High" barometric pressure is associated with clear skies, while "low" barometric pressure is associated with cloudy skies and rain. This table illustrates the impact of temperature on maximum potential water vapor content and air density at a pressure of one atmosphere. Water vapor is the component of air which can vary the most from place to place, from day to day, even hour to hour. The amount of water vapor in air will literally change with the weather and other variables such as proximity to large bodies of water, and the temperature of the water in those nearby lakes, seas and oceans. Both "relative" and "absolute" humidity measurements have been developed to quantify the amount of water vapor present in atmospheric air. Relative humidity is closely linked to human comfort. Both very dry air and very humid air are less comfortable than air which has a relative humidity of about 50%. Absolute humidity is most useful for engineering calculations such as sizing equipment to be used for compressing or drying / de-humidifying air. The body of knowledge and techniques which allow physical and thermodynamic properties of air to be calculated for any set of temperature and pressure conditions are known as psychrometry. Useful definitions and relationships related to water content and other properties of air are summarized below - and presented in more detail on the psychrometry page. Dry bulb temperature is what is usually meant by "air temperature". It is measured with a normal thermometer. Dew Point: Dew point is the temperature at which water vapor begins to condense out of the air. Dew points can be defined and specified for ambient air or for compressed air. Wet bulb temperature is never higher than dry bulb temperature. They are equal when air is at its dew point or saturation temperature. The difference between the dry bulb and wet bulb temperatures is an indicator of the humidity level. Wet bulb temperature is a critical parameter for sizing, and measuring the performance of evaporative-cooled cooling water systems. Relative Humidity: Relative humidity at dew point conditions is 100%. Otherwise, relative humidity is the percentage of the amount of water vapor actually present in the air, to the maximum amount that the air could hold under those temperature and pressure conditions. This measurement is highly correlated with human comfort - with about 50% being most comfortable . Absolute Humidity: With the aid of a psychrometric chart, or its computerized equivalent, absolute values for water content such as weight fraction of ambient air, or weight-per-unit-volume of ambient air can be determined for any combination of dry bulb and wet bulb temperatures, or combination of dry bulb temperature and relative humidity. This measurement is required to design various types of moisture removal or humidification systems. Psychrometric charts graphically represent the thermodynamic properties of air. They depict inter-relationships between multiple properties, such as temperature, moisture content, density and energy (enthalpy). Charts can be drawn for various elevations. For each elevation two known properties allow determination of all other properties plotted on the chart. Or use an online psychrometric calculator to generate properties for air. Specify two properties (e.g. dry bulb temperature and % relative humidity) and calculate other thermodynamic and physical values. The calculator will correct for elevation (or ambient pressure). The I-P and SI psychrometric charts and the online psychrometric calculator are provided under license from the Linric Company. For convenience, much information about air is specified for "sea level" or "one atmosphere" conditions. But much human activity takes place at higher elevations - in come cases only a few feet or meters above sea level - in other cases hundreds or thousands of feet or meters higher. Almost all of our activities take place in the lowest level of the Earth's atmosphere - the Troposphere. The Troposphere extends to a height of about 6 kilometers (4 miles) at the poles, and to 11 kilometers (36,000 feet or 7 miles) near the equator. The Troposphere has similar composition at all levels, but its average pressure, temperature and density decrease with altitude. In the lowest levels of the atmosphere, air temperature decreases as elevation increases - on average, about 3.56˚F for every 1000 feet, or 6.5˚C for each 1000 meters of elevation. Atmospheric pressure drops as elevation increases - about 0.5 psia for each 1000 feet of elevation, or about 1.1 kPa for each 100 meters. Air density decreases rapidly with increasing altitude or elevation. NOTE: An expanded version of this table is available. Click here to view it. Just above the Troposphere is the Lower Stratosphere, which long-distance jet aircraft pass through. At the boundary between the Troposphere and Lower Stratosphere, atmospheric pressure is about 3.1 psia or 20.1 kPa and the temperature is about -69˚F or -56˚C. The Lower Stratosphere is an almost constant temperature region, to an altitude of about 25 Km (86,000 feet, or 15 miles). Nitrogen, Oxygen and Argon, the three primary constituents of air, can be recovered from air in air separation plants. Each of these atmospheric industrial gases is valued for particular properties. Each of these gases are used extensively in industry, the medical field, and in some products used in homes. Oxygen is valued for reactivity. It supports biological processes and combustion in many industries. It is used in steelmaking and other metals refining and fabrication processes, as well as in chemicals, pharmaceuticals, petroleum processing, glass and ceramic manufacture, pulp and paper manufacture, healthcare, environmental protection (through treatment of municipal sewage and industrial effluents) and in other miscellaneous uses. Oxygen is often used with, or instead of, air to maximize the amount of oxygen available for combustion or biological activity. It is used to assist breathing in hospitals and other places. In industry, oxygen is used to increase reaction rates in industrial equipment and processes, to allow greater throughput in existing equipment and smaller sizes for new equipment. In some cases, such as industrial and municipal effluent treatment, normal oxygen (O2) is first converted to ozone (O3), which is a more reactive form of oxygen. Using ozone instead of normal oxygen enhances reaction rates and ensures complete elimination of undesired compounds. Gaseous nitrogen is valued for inertness in many industrial applications. It is used to shield potentially reactive materials from contact with oxygen. It helps maintain quality, and ensure safety in numerous applications. (It is not a truly inert material as it will oxidize at very high temperatures and is routinely consumed in some biological processes). Liquid nitrogen is valued for coldness plus inertness. Vaporizing liquid nitrogen and warming the gas to ambient temperature absorbs a large quantity of heat. Liquid nitrogen, combining inertness with intense cold, is an an ideal coolant for certain specialized applications. One of these is food freezing, where very rapid freezing results in minimal cell damage from ice crystals, leading to improved appearance, taste and texture when thawed. Liquid nitrogen is also used to facilitate machining or fracturing of soft or heat sensitive materials. These include plastics, certain metals, pharmaceuticals, and even sophisticated processes which shred used tires - turning a difficult to handle waste product into materials which can be recycled into other useful products. Argon is valued for its total inertness. It is used in critical industrial processes such as producing high quality stainless steels and growing impurity-free silicon crystals for semi-conductor manufacture. It is used as a shield gas in critical welding applications, as a filler gas for light bulbs and as a heavier-than-air filler gas for the space between glass panels in high-efficiency multi-pane windows. The so-called "rare" gases Neon, Krypton and Xenon, are present in very low concentrations in air, which makes them economically recoverable only in large air separation plants. All of these gases are monatomic. They are valued for chemical inertness and for their light emitting properties when electrically charged. The boiling point of Neon is significantly lower than nitrogen (lower than all the gases except helium and hydrogen). It can be used as a very low temperature working fluid in refrigeration cycles. Krypton and Xenon have additional uses that take advantage of their inertness and high molecular weight (83.80 and 131.30, respectively). Krypton and Xenon are about two to three times as heavy as argon (molecular weight 39.95) and approximately three to four times as heavy as nitrogen (not a true inert gas) at 28.0. Krypton and Xenon are used in very high insulating value multi-pane windows as they minimize heat loss due to convection between the panes. These gases are also used in light bulbs, where their presence as a filler gas slows evaporation of the hot tungsten filament, leading to longer useful operating life and/or the ability to use higher efficiency, thinner filaments while still retaining acceptable operating life. Many aspects of air separation design and operation are determined by the properties of air. Air separation plants are designed to handle expected concentrations of non-standard air components safely, and in a manner which ensures the purity of protects. When the local atmosphere is known to contain (or potentially contain) unusually high concentrations of gases such as sulfur oxides, CO2, hydrogen, ammonia, methane or higher hydrocarbons, additional purification (impurity removal) processes are added to the air compression and air separation systems. Average atmospheric pressure at a plant site (which is primarily a function of elevation) must be known to properly select air compression machinery. Air compressors are typically equipped with inlet guide vanes or other means of capacity control, but still have a limited range of operation. The maximum volume of inlet air that can be processed in a compressor (as measured in actual cubic feet or cubic meters per minute) is similar at any inlet pressure. To deliver the same amount of air (measured in Pounds, Tons, Kilograms, Standard Cubic Feet, Normal Cubic Meters, etc.) when operating at high elevations, a compressor must process greater physical volumes of inlet air than would be required if the compressor were being operated near sea level (about 3.4% more for each 1000 feet or 1.1% more for each 100 meters). To achieve the same discharge pressure when the inlet pressure is lower than it would be at sea level, the pressure ratio across the compressor must be higher; which requires more power. Temperature Impact on Compression Capacity: Cold, dry winter air can be 10% denser than dry summer air. Since air compression equipment has limited ability to adjust the volume of inlet air that will be compressed, lower density summer air decreases the air handling and production capacities of air separation systems while higher density, cooler winter air results in greater air compression capacity (as measured in standard cubic feet, standard cubic meters, or by weight). Humidity Impact on "Dry Air" Delivery: The effective "dry air" compression capacity of air separation plants is reduced on humid days. Water vapor entering an air separation system must be removed to meet product specifications and to avoid operating problems. This removal occurs automatically in interstage coolers in which the condensed water is drained off. Since humidity can represent as much as 5% of the volume of ambient air on a hot, humid summer day, the ability to deliver "dry air" to the downstream air separation equipment can be reduced by as much as 5% on such days. Density Impact on Discharge Pressure: The pressure that is developed across a centrifugal compressor is a function of the density of the gas being compressed. Less-dense hot and humid air results in less pressure increase. Conversely, higher discharge pressures are available when compressing cool dry winter air. Because of these atmospheric effects, the effective production capacity of air separation equipment can be measurably reduced on hot, humid days compared to winter and yearly-average conditions. The concentration of carbon dioxide in the atmosphere shown in the table above (404 ppmv) is representative of the current annual average level (2016). This is an historically high value for the concentration of CO2 in the Earth's atmosphere. It is quite possible that the concentration of carbon dioxide in air has not been this high for many hundreds of thousands, if not millions of years. Conventionally, carbon dioxide is considered to be a component of "standard air". However, unlike other components of "standard air" (such as nitrogen, oxygen and argon) which show very little variation from place to place or over time, the concentration of carbon dioxide in air changes with location and the seasons of the year. On an annual basis, the concentration of carbon dioxide in air rises and falls in a seasonal pattern; with the span between the seasonal high and low values typically being about 6 ppmv; or about one-and-a-half percent of the average annual value. These variations in carbon dioxide content in the atmosphere reflect the fact that carbon dioxide is continually being produced and removed from the atmosphere by a multitude of mechanisms, and therefore the concentration of CO2 in air at a given place and time reflects both local conditions and global factors. There is much concern about, and interest in understanding, the mechanisms which have caused the concentration of CO2 in air to rise significantly since the first part of the Twentieth Century. Around the world, many people are seeking to better understand the potential environmental changes which may result if the concentration of CO2 in the atmosphere continues to rise at a rapid rate over the next few decades; and are seeking to define actions which are prudent to take, both as individuals and as governmental bodies, to slow the rate of increase. Multiple studies have investigated the composition of "fossil air" bubbles trapped in thick ice accumulations which have built up over tens, and even hundreds of thousands, of years. Samples from Antarctica have provided a continuous record going back about 420,000 years. They show that long-term cycles of global cooling and warming, which typically span a period of about 70,000 years or more, have been accompanied by characteristic changes in the CO2 content of the atmosphere. The concentration of atmospheric carbon dioxide found in these "fossil air" bubbles is typically found to be about 180 ppmv near the end of periods of global cooling and widespread glaciation. The concentration of CO2 in air during warmer inter-glacial periods typically rises from that level to around 300 ppmv. Consistent with the apparent pattern observed in older samples, the carbon dioxide concentration in air bubbles trapped between 18,000 to 11,000 years ago, when the last period of widespread glaciation ended, was around 180 ppmv. Also consistent with the pattern seen in earlier cycles, a fairly sharp rise in the concentration of atmospheric carbon dioxide followed the most recent glacial retreats. Rising at an average rate of about 11 ppmv per thousand years, the concentration of CO2 in air increased to 300 ppmv in the first half of the Twentieth Century. A great deal of this longer term rise has been attributed to release of CO2 to the atmosphere as ocean waters slowly warmed. 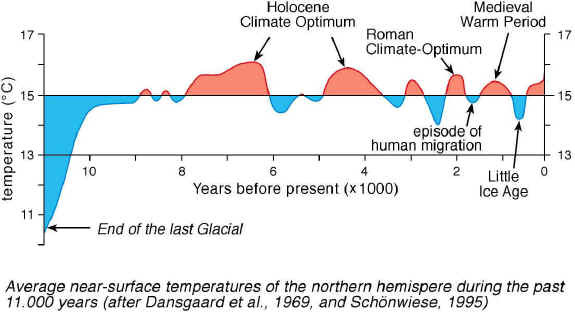 Post-glacial warming was not a "straight line" phenomenon. Temperatures rose to modern levels about 9000 years ago; but then began to fluctuate. Between 8000 and 6000 years ago, and several times since, the average temperature of the near-Earth atmosphere has been the same or higher than its current value. In fact, over the last 7000 years the Earth has apparently gone through more than half a dozen significant warming and cooling cycles . While these post-glacial changes in temperature were much smaller than those which define "glacial" and "interglacial" periods, they were strong enough to have a major impact on local climates (e.g. in Greenland and in the Sahara). One of the impacts of global warming over the last 18,000 years was a significant rise in average sea level of more than 100 meters (or about 330 feet) as a great deal of previously-frozen water made its way into the Earth's seas and oceans. Shorelines, about 10,000 years ago were tens and even hundreds of miles away from the coastlines we are familiar with. About half of this rise was completed by about 10,000 years ago. Then, over the next 5,000 years, sea levels rose further, to approximately 5 meters below current levels. During the last 5,000 years, the increase in sea level has continued much more slowly. Since the mid-Twentieth Century, the concentration of CO2 in the atmosphere has continued to rise from what can be considered to be a typical interglacial end-stage concentration of 300 ppmv, to its current value of about 404 ppmv. And it has done so at an increasingly rapid rate. The rate of carbon dioxide concentration increase is now approximately 2.5 ppmv / year; or an annual growth rate of about 0.6%. There is every reason to believe the concentration of CO2 in the atmosphere will continue to increase for several decades, at the very least, even with attempts to limit the rate of growth of man-made emissions from cars, industry and power generation. Many human activities, including the use of carbon-containing fuels for heating, industry and transportation, and wide-spread de-forestation, have undoubtedly contributed to the recent rapid rise in atmospheric carbon dioxide concentration. What can be done, and what should be done, about the rising concentration of CO2 in the atmosphere are matters of intense global research and debate. The Earth's atmosphere has changed drastically over time. The air that we are accustomed to breathing is the product of billions of years of evolving life forms interacting with the seas, the land, and the air. The concentrations of both carbon dioxide and oxygen in the air are the result of a complex dynamic balance between mechanisms which remove these gases and others which replace them. About 4 billion years ago, the Earth's atmosphere was mostly CO2. The development of anaerobic bacterial photosynthesis and blue-green algae ("cyanobacteria") about 3.5 billion years ago resulted in the release of oxygen to the atmosphere and the sequestering of carbon, lowering the level of CO2 in the atmosphere. The changing composition of the atmosphere had a" reverse greenhouse effect" on the Earth's energy balance; producing a prolonged period (about 500 million years) of widespread glaciation between 2.5 and 2.0 billion years ago. As photosynthesizing plants and other life forms, such as sea creatures appeared, more carbon dioxide was removed and sequestered in organic matter and as carbonate in shells. Eventually, oxygen levels in air increased to near the current level, paving the way for new life forms to emerge and evolve which were dependent upon oxygen in the air. Oxygen and carbon dioxide concentrations in the atmosphere have been maintained at near current levels for millions of years through many dynamic, and largely-self regulating, inter-relationships between the land, the seas, the air and various life forms. Oxygen is reactive. Without replenishment by photosynthesis, its concentration in air would decrease as it combined with other elements to form various compounds. Carbon dioxide is continually produced and removed from the atmosphere by a multitude of natural mechanisms. CO2 dissolves in water (including rain) and carried into rivers, lakes and the oceans, and it is removed by photosynthesis. It is replenished by oxidation of dead organic matter and by animal respiration. If the carbon dioxide content of air increases, it results in more vigorous plant growth, which removes CO2 at a faster rate until a new equilibrium between production and removal is established. Scientific measurements of "fossil air" bubbles trapped in Antarctic ice sheets indicate that over the past four hundred and twenty thousand years the concentration of CO2 in the Earth's atmosphere has repeatedly fluctuated between about 180 ppmv and 300 ppmv. The lowest concentrations of CO2 in air have corresponded to periods which have followed prolonged and widespread glaciation. The highest levels of CO2 were reached near the end of the warmer interglacial periods. This chart, which depicts recently-analyzed data on the composition of "fossil air bubbles" trapped in polar ice (a set of samples spanning more than 400,000 years), provides additional perspective. Current atmospheric CO2 concentrations are now above those which have been typical near the end of the previous four inter-glacial periods. The charts below shows monthly data on CO2 concentration in the atmosphere between 2012 and the end of 2016. 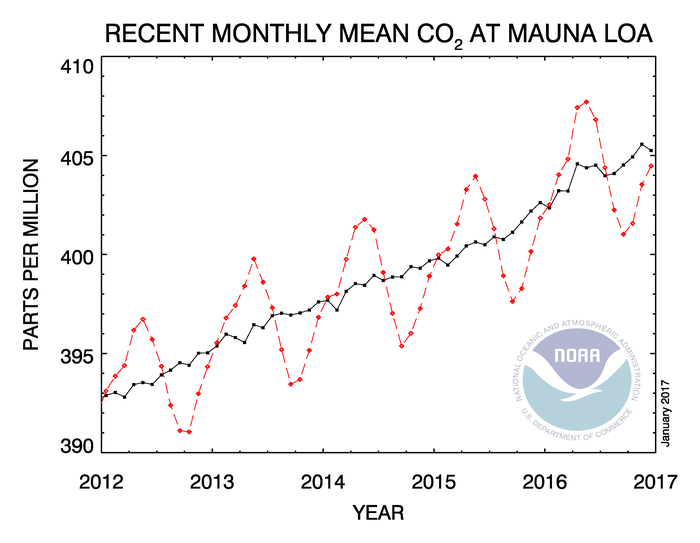 Both monthly and annual average atmospheric carbon dioxide concentrations are shown for data taken in the mid-Pacific, at Mauna Loa, Hawaii. Data shows the dry air mole fraction of air (after removing water vapor - with CO2 included in the total). Monthly data is shown in red. Longer term moving averages are in black. This chart shown below shows changes in the concentration of CO2 in air at the Mauna Loa test site over almost six decades (March 1958 through December 2016). What do these historical records tell us about the current situation? Very simply, we appear to be in uncharted waters. Atmospheric carbon dioxide concentrations measured over the past hundred years or so, have been consistently higher than the approximately 300 ppmv level which has typically been reached near the end of earlier interglacial periods; and they are rising at a rapid rate. There is disagreement about many aspects of cause and potential effect; however, there is general consensus that the rapid rise in carbon dioxide concentration is cause for concern. Many people are concerned that increasing levels of carbon dioxide in the atmosphere will lead to increasingly hotter average worldwide temperatures, with rising sea levels, changes in local climates, and inevitable changes in local and global agriculture, water resource availability, species mix, etc. Some people are concerned that rapid heating may become so disruptive to normal sea salinity levels and heat transfer mechanisms in the oceans, that a trend reversal may occur, triggering rapid cooling in near-polar areas and even faster heating in equatorial regions. These concerns have triggered intense interest in increasing our collective understanding of what is happening, why it is happening, how much of the relatively recent rise in atmospheric carbon dioxide levels is due to human activity, and what can and should be done to control emissions of carbon dioxide. The rising atmospheric CO2 level has become a political issue in addition to being a scientific issue. People throughout the world are debating the likely impacts of continuing "business as usual" versus making conscious changes in the way we all consume and discard carbon-containing materials. It is clear that historical changes in the level of CO2 in the atmosphere have correlated well with changes in the average temperature of the atmosphere. However, the two are inter-dependent, and either can be the cause and the other the effect under certain circumstances. There are many interactions between natural processes, and feedback loops which are, at best, only partially understood. The impact of all of these factors on global weather patterns and ultimately on the livability of many currently inhabited areas and the sustainability of life on Earth as we currently know it. "Global Warming" is not a new phenomenon. The Earth has gone through many periods of rising and falling average temperature, triggered by multiple causes. The last period of widespread glaciation reached its maximum about 18,000 years ago. 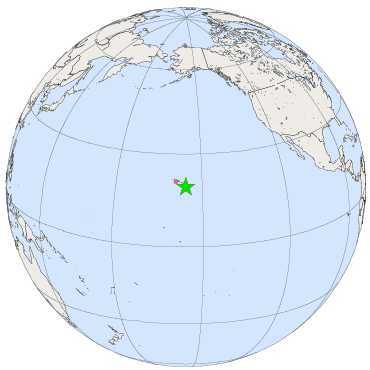 (See map.) About 11,000 years ago, after 7000 years of increasing air temperatures, glacial ice was in full retreat. The average global temperature was still 3 to 5˚C cooler than at the present time. Early post-glacial sea levels were as much as 100 meters (300 feet) lower than they are now due to so much of the Earth's water being locked in ice on land. The entire development of human civilization as we know it occurred in this most recent interglacial period. Our ancestors not only survived, but thrived, as "global warming" triggered major changes in local climates and geography. Within a few thousand years after this interglacial period began, rising sea levels, fed by melting ice, caused land bridges between continents to disappear, coastal areas became inundated by sea water and inland river valleys were flooded; becoming future sites for both small fishing villages and major cities along these "new" seacoasts. Average temperatures did not rise slowly and smoothly to present levels following the last glacial period. Instead, average temperatures increased fairly rapidly until about 8,000 years ago, at which time they were close to current levels. But then, warming continued for almost two thousand years, rising to higher levels than we have seen recently. Around six thousand years ago, average temperatures dropped rapidly; reaching levels lower than today, and stayed lower for a thousand years. In fact, over the past seven thousand years, there appear to have been six significant cycles of interglacial cooling and warming. This NOAA plot shows the agency's best estimates for average temperatures over the past 1000 years. The Medieval Warm Period was followed by a cooler period which is often referred to as the Little Ice Age. It lasted from about the mid to late 1300s into the late 1800s; almost 500 years. The the bitter cold winters depicted in scenes of the American Revolution, in the 1770s, occurred during this period. A little more than one hundred years ago, following the end of the last prolonged cool period, the Titanic hit an iceberg that was one of many which were released as a then-welcome spell of global warming began to be felt. The end of the "Little Ice Age" period, in the mid to late 1800s, roughly coincided with the start of a significant rise in industrial activities. Some people claim that industrialization is the cause of the warming trend since then. It may be equally true that the warming trend spawned the vibrant growth of society and industry that began as temperatures began to rise. It is currently popular to point to the increasing industrialization of the world, coupled with significant human population growth, as primary factors contributing to increases in the concentration of carbon dioxide in the atmosphere. However, it is very likely that there are multiple interrelated links between the rise in average global temperatures and the rising carbon dioxide content of air over the past hundred years. At the end of the last glacial period, when air and sea water temperatures were well below current levels, the concentration of carbon dioxide in the air was approximately 180 to 200 ppmv. As the world warmed, the concentration of CO2 in the atmosphere rose. In the early to mid-1800s, prior to the end of the "Little Ice Age", the concentration of CO2 in the air was about 280 ppmv. This value has been referred to by many analysts as the "pre-industrial" CO2 level in the atmosphere. Much of the rise from the post-glacial level of CO2 in the atmosphere, to the mid-1800s level, has been linked to warming of the oceans. The US National Oceanic and Atmospheric Administration estimates the oceans contain about 50 times more CO2 than the atmosphere and 10 times more than plant and soil carbon stores. The amount of CO2 that the oceans can hold is temperature dependent, with much of it held in deep cold waters. Circulation patterns transport CO2 up and down in the ocean, and there is constant interchange of carbon dioxide between the oceans and the atmosphere. Average temperatures in the ocean change much more slowly than average air temperatures. As the average and surface temperatures of the world's oceans have increased, a portion of the stored CO2 has been released to the atmosphere. The rise in atmospheric CO2 concentration which occurred between the early-1800s to the mid-1900s was gradual. In 1960, the average concentration of CO2 in the atmosphere was about 315 ppmv. 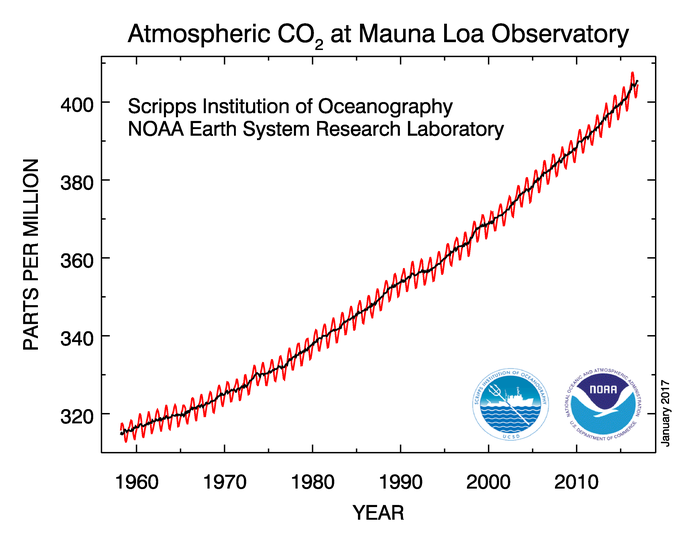 Since the mid-1900s, the concentration of CO2 in the atmosphere has increased significantly, and the rate of rise has been accelerating. Currently, the average measurement is about 404 ppmv, and the annual average value is rising at about 2.5 ppmv / year. Since the acceleration of population growth and industrialization throughout the world in the past 60 years or so coincides with an increase of more than 25% in the concentration of carbon dioxide in the atmosphere during that same period, it is reasonable to assume that many human activities, including the use of carbon-containing fuels for heating, industry and transportation, and wide-spread de-forestation, have been and are contributing to the rapid rise in atmospheric carbon dioxide concentration. What can be done, what should be done, and the best way to do what seems prudent to do about the rising level of carbon dioxide in the atmosphere, remain subjects of intense global research and debate. All material contained herein Copyright 2003 / 2019 UIG.